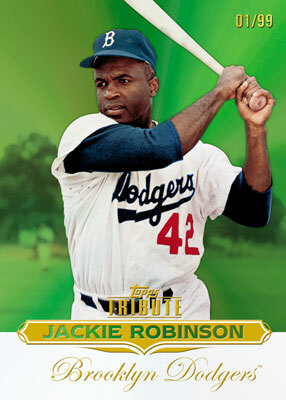 Topps Tribute returns for a third season of high-end, old school baseball card action this April. The product promises to be an improvement over past incarnations with the addition of book cards and a host of other intriguing new cards. 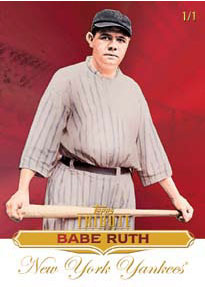 2011 Topps Tribute will deliver 6 hits and is expected to carry a box price of around $250. Topps promises an improved and expanded retired player checklist. All autographed and relic cards are numbered to 99 or less. 6 parallel cards numbered to 399 or less per box! Roll Call Book Cards - Multi die-cut relic book cards spelling out a player's first and last name. Ten subjects in all with each numbered to 9! Book cards come in 1/1 red parallels as well. Tribute Rookies Book Cards - Book cards featuring ten of 2010's biggest rookies. Each card features a relic swatch and come in 1/1 red parallels. 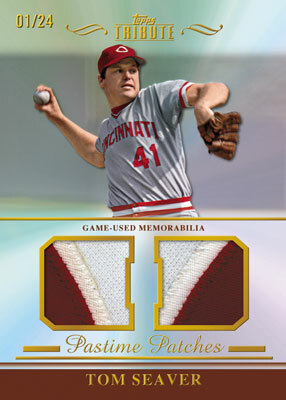 Pastime Patches Dual Relics - Each card acknowledges one of 25 current Superstars or Legends along with 2 game-used patches from that player. Each card is numbered to 24. 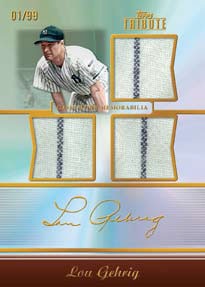 Quad Relic Cards - Each of the 10 subjects is complimented with 4 relics and numbered to 99 or less. 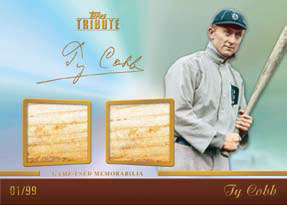 Triple Relic Cards - 15 players appear on the checklist featuring 3 relics per card, each is numbered to 99 or less. Dual Relic Cards - 100 players featuring 2 relic pieces per card, each is numbered to 99. All relic cards numbered to 99 come in Green /75, Black /50, Gold /25 and Red 1/1 parallels. Tribute Cut Signatures - 10 different 1/1 cut signatures featuring MLB Legends that are no longer with us. 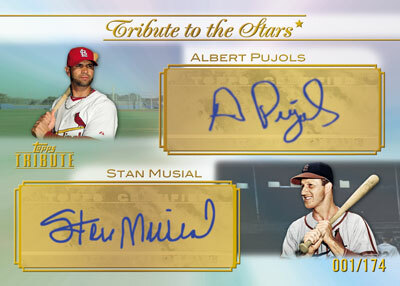 Tribute to the Stars Dual and Triple Autographs! 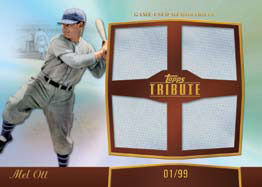 Autographed Dual & Triple Relic Cards - Autographed cards featuring 2 and 3 relic numbered to 99! 100 Card Base Set featuring a combinations of rookies, legends and current day stars. Autograph checklist includes Ozzie Smith, Albert Pujols, Nolan Ryan, Alex Rodriguez, Ryan Howard , Buster Posey, Duke Snider, Ryne Sandberg, Jason Heyward, Robinson Cano, Josh Hamilton, Starlin Castro, Ralph Kiner, Don Sutton, Cal Ripken Jr., Don Mattingly, Joe Morgan,Tony Gwynn, Willie McCovey, Wade Boggs, Ernie Banks, Yogi Berra, Stan Musial and more! This is my favorite Topps Tribute product to date. I’ve only broken boxes of 2 other Topps Tribute sets, which gives me a solid point of comparison. 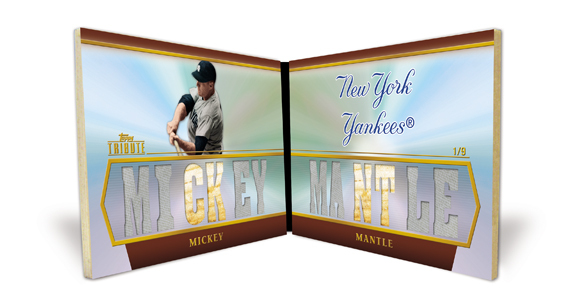 I really dig the design and appreciate the fact that they have refocused the theme of the set to highlight the greats and legends of the game (which is how this product is supposed to be) as last year’s installment put way to much emphasis on rookies. Haven’t touched or seen one of these, but going off the professional reviews and the photos of the cards, I’m giving it a 5/5, mostly to offset the 1/5 troll user review just above this one.